Almost nine out of ten cervical cancer deaths worldwide occur in the developing world. Researchers from the University of Heidelberg are rolling out screening to women most at risk. In the developed world, regular screening, early detection and rapid treatment have led to positive long-term outcomes for women diagnosed with cervical cancer. In the developing world, the disease is still a killer. 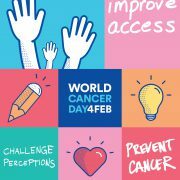 In Western Europe or Australia/New Zealand, for example, for every 100,000 women diagnosed with the disease, fewer than two will die from it, according to figures from the UN’s World Health Organisation (WHO). In East Africa, it’s closer to 30 (27.6). There, few women will ever be screened. For many of those diagnosed, treatment comes to late. In fact, almost nine out of ten (87%) of cervical cancer deaths occur in less developed regions. And since the disease is particularly prevalent in women in their thirties, many victims leave dependent children behind. Of the twenty countries worldwide with the highest incidence of the disease, sixteen are in Africa, says the World Cancer Research Fund International. But the screening processes that have proved so successful in the developed world, based on annual or three-yearly Pap smear tests, are difficult to implement elsewhere, explains Dr Magnus von Knebel Doeberitz, a professor of molecular oncology and microbiology at the University of Heidelberg in Germany. 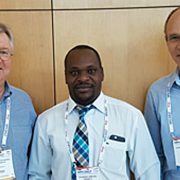 There are considerable costs involved, he explains, not least to train pathology technicians in the cytology skills needed to analyse Pap smear test results. Although this test has undoubtedly saved the lives of many millions of women in the developed world, it has its weaknesses, among them ‘false positive’ findings, sometimes leading to unnecessary biopsies, and more seriously, ‘false negative’ findings, where malignant cell changes go undetected. So, in the developed world, skilled analysis and repeat testing of women is still required. In Africa, by contrast, the infrastructure challenges involved in getting women to regular screenings, let alone to make subsequent repeat visits and undergo treatment, are immense. Paper-based medical record systems only slow responses down further. So my personal dream has always been to implement these tests in Africa, because that’s where the real suffering happens. In the absence of a commercially viable market in Africa, however, it’s been difficult to bring that dream to fruition – until a few of his investors came forward with backing for a trial of the test in that region. And even then, there was still the hurdle to cross of making screening available to women, especially those in rural areas, and tracking and communicating their results. He suggested SAP could help us in this respect. We could establish a system using cloud-based technology, available through mobile phones, to transmit information to patients, physicians and local healthcare workers in the villages. 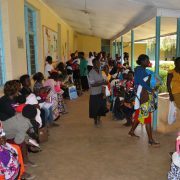 The initial focus of Dr von Knebel-Doeberitz’s Emerging Technologies in Cervical Cancer Screening (ETiCCS) project is currently a one-year study involving 800 women, delivered by the Moi Teaching and Referral Hospital in Eldoret, Kenya and funded by the German Federal Ministry of Education and Research. Much of the technology involved was provided for free by SAP and Intel. Roche, meanwhile, has provided the test kits. Dr von Knebel-Doeberitz and his team worked with staff at the Design & Co-Innovation Centre team at SAP’s AppHaus Heidelberg centre, to design a mobile app that would work for the project, based on the company’s HANA Cloud Platform. This is designed to accelerate study recruitment and provision of cancer test results. SAP has produced a video showing the app at work. It’s slowly developing, but we need more public interest. We hope we can get more funding because, right now, we have enough for about two years, but after that, we’re not sure. What we do know is that we would like to be rolling out this kind of screening on a broader basis to other countries too, such as Tanzania. We need to show industry that there’s a market here for them. Without that, it would be incredibly naive to imagine that big pharmaceutical companies will get involved. But with the help of SAP, we’re now able to give them a glimpse of that market – and get better outcomes for patients and their families, too.